Sometimes “one” can end up being many. 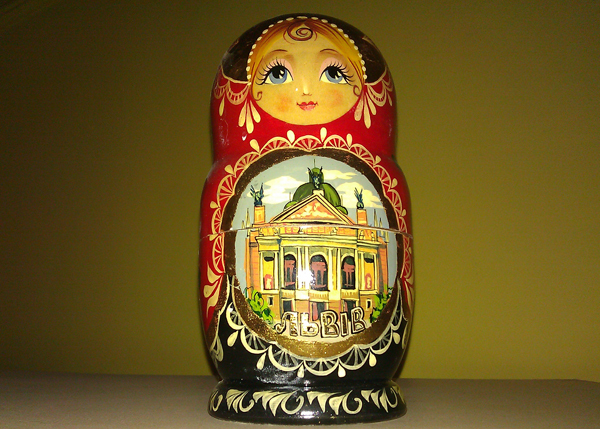 This photo is of a Matryoshka Doll I bought at an outdoor art bazaar near the Opera house in Lviv, Ukraine, when I was there in 1999. It is one doll turned in wood, but contains 4 smaller dolls, each nesting inside the next larger one. A version of these women character toys have been around since 1890. They originated in Russia, however, during Soviet times were made in many of the satellite countries like Ukraine. I’ve read that the word Matryoshka is linked to the Latin root “mater,” meaning mother and is associated with fertility. During the 19th Century the realistic faces were painted utilizing many of the Byzantine iconographic styles. I’m drawn to them because they are narrative sculptures. Each one tells a story. The one I’ve pictured here, each figure has a landmark building in Lviv, Ukraine painted on it. They and the traditional Byzantine icons continue to provide inspiration for my artwork. This entry was posted in art, narrative sculpture, Ukrainian and tagged icons, Postaweek2011, Weekly Photo Challenge. Bookmark the permalink. You are very talented. I look forward to coming back again to see more. Thank you. You are very kind to look and comment. I’ll take more time to read your blog in the morning.